Ebony Was great!!! I will recommend her to family and friends. She got everything I wanted. She is a people person with a great personality..
Everything was perfect and chris davis is the best sells man every. He helped me with everything throughout this journey. I would recommend this dealer to anyone. Great service,I was treated well. Soto and Chris were nice to work with. Hassle free. Will be returning in the future. Went in for a refinance (repurchace) of my current car. Eric is my go to at World Hyundai, he (Edwin and Raul) helped me out like always, got a lower interest rate and lower payment which was what I was looking for :) World Hyundai always takes care of me. Thanks guys! I am beyond satisfied with what David King and has done for me today. He is very patient, caring and understands the ends and outs of the business. I have never been to a dealership and received great satisfaction. David King get 10 stars in my book!!!!!!!!!!!!!!!! 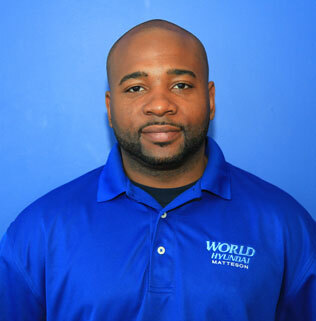 Thank you for working with our sales professional, David! We are more than happy to have reached your level of satisfaction! STEVE WAS A VERY GOOD SALESMAN. I FELT NO PRESSURE AT ALL FROM HIM. HE EXPLAINED EVERYTHING TO ME, HOW THINGS WORK ON THE CAR. HE TOOK THAT EXTRA STEP WITH ME. I WILL DEFINATELY RECOMMEND HIM TO OTHER HYUNDAI BUYERS. Thanks for your great words, Kate! We love to hear that you were satisfied with your car buying experience! Edwin ... My experience with Edwin today was totally awesome! He was able to get me into something newer, with lower payments all around. I was extremely satisfied and will definitly recommend to all family and friends, as well as continue to purchase vehicles here...great experience!! I am extremely pleased with the service I received from Mr. Dan. We think Mr Dan is a great guy too! We really appreciate your business. Very low pressure, very easy to deal with, and took care of me very well. I would do business here again! Jim was great, the whole process was quick and all our questions were answered. I am very happy with my purchase. Rory was so informative. He was very helpful. He gave all the information we inquiry and more. He was a great salesperson. I felt very comfortable in the selective he provided. I will refer more of my friend to him!!!!!!!!!!!! !